A new level of luxury living has arrived in the heart of London. In an exclusive partnership with Versace Home, the global symbol of opulence, DAMAC Tower Nine Elms brings you the ultimate in branded living experiences. Rising 50 storeys, the ultra-modern DAMAC Tower will stand out as a new icon on the London city skyline. Stone, terracotta and glass come together in a fresh and distinctive world-class design to create an inspiration in luxury living, inside and out. The unique and balanced architectural composition has been carefully crafted to create impressive views from every aspect of the building. The DAMAC Tower Nine Elms London experience goes beyond four walls – step outside and enjoy new walkways and a beautiful public piazza in which to relax and unwind. 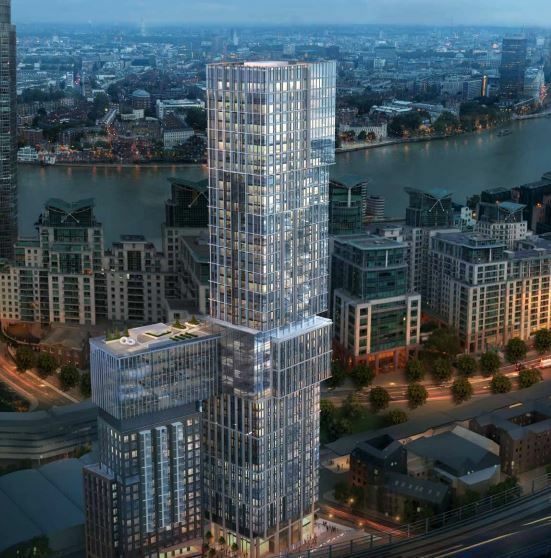 The Nine Elms area is already home to the New Covent Garden Market, the new US Embassy and Battersea Power Station, a cherished feature of the London skyline. It’s also blessed with almost two miles of Thames river frontage, and will be lined with cafés, bars, restaurants, cultural attractions and public space as part of the planned regeneration. DAMAC Tower Nine Elms London is nestled between Vauxhall and Battersea, where a multi-billion pound investment is dramatically transforming the area into an ultra-modern residential and internationally significant business district, set to become a new centre for arts and culture in the capital. The area is close to the Vauxhall Cross rail and bus stations as well as the Underground. In addition, the new Northern Line extension and the Crossrail project further enhance its strong transport links with the rest of London.